As I’m writing this I feel seriously pumped up. Yesterday morning I was feeling pants. I’d had a week of indulging on alcohol and meat (cheap meat at that) and my body was seriously suffering. We drove back from Nottingham, with drizzly English summer rain following our car for each of the 100 miles back to our little flat. But, as we walked through the door it started to brighten up. Jon was knackered put the kettle on and got settled on the sofa. I on the other hand put on my running shoes and went out for a jog. Without grossing you out I could feel myself sweating out the alcohol and the beef that had been weighing me down. It was a difficult run but I needed it and I felt so much better for having gone out in the sunshine and batted the blues away. This week I am not making any more excuses. I’m going cold turkey on all the naughty things that have been dragging me down over the last month or so and celebrating fresh wholesome food. 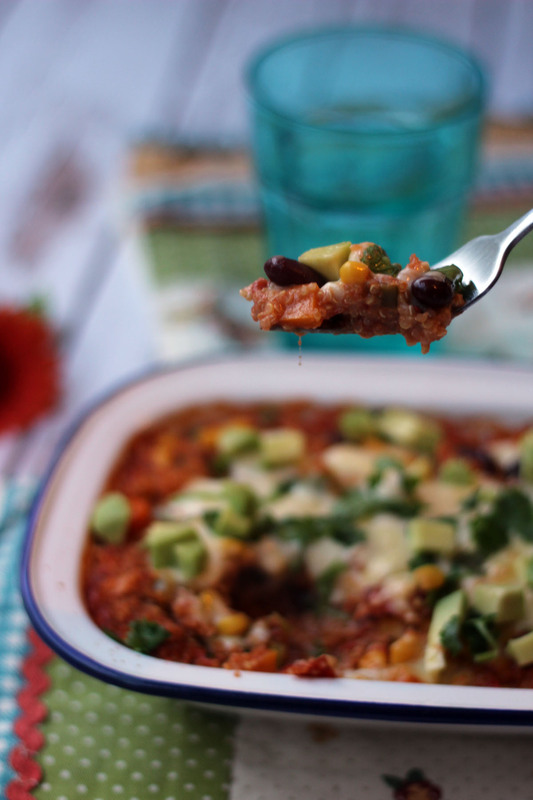 This Mexican Quinoa Casserole is a celebration of all that is good and nutritious. It is packed full of vegetables of all colours, shapes and sizes as well as quinoa, kidney beans and a little cheese which makes for a healthy dinner that everyone will love! Most of you will know I’m a big fan of Mexican flavours and any chance to chuck in a chipotle or serve up some avocado and I am there. This Mexican Quinoa Casserole recipe combines lots of classic Mexican ingredients in a fun new way. Despite my love of Mecian food I rarely see it as something healthy,so what I love about this recipe is that you can enjoy it without feeling like you need to instantly go and run off the calories. Healthy food can be tasty too!!! Don’t you think? As well as being Tex-Mex inspired I love this recipe because it uses oh-so-trendy quinoa in a new and exciting way. I fell in love with Quinoa Casseroles when I posted this Broccoli and Quinoa Casserole back in February. They gooey, umptious casserole is true comfort food. The quinoa oozes lazily when you spoon a portion on to your plate and fills you with warmth. The only downside is quinoa casseroles are also incredibly difficult to photograph (#foodbloggerissues), but they make people happy! One pot dinners like this Mexican Quinoa Casserole are a great way of bringing people together around the table. This recipe can easily be scaled up for larger groups, and when served up with salad, salsa, hot mexican pickles and plenty of sour cream this becomes a delicious feast for a whole family or group of friends. Alternatively stick to my two-person version for a tasty, wholesome mid-week meal that feels like a treat. Pre-heat your oven to 180C (or gas mark 5). Cook your quinoa according to the packets instructions – most quinoa will cook on the hob with a little water in just 15 minutes. Remove from the heat, drain and set to one side. While the quinoa is cooking, heat a little oil in a large pan. Saute the peppers and onion until they have begun to soften, roughly 5 minutes. Add the chilies, cumin and garlic along with the sweetcorn and beans and cook for a further 5 minutes. Next add the chopped tomatoes, stir well before adding the quinoa and take off of the heat. Stir in the sour cream well before transferring to the oven. Cook the casserole in the oven for 20 minutes, adding the cheese in the last 5 minutes. Leave to rest for 5 minutes before serving topped with the fresh coriander and diced cubes of avocado. So, tell me have you tried quinoa before? Most people try it in salads but I love using it as a replacement for rice and other grains in hot dishes like this. If you’ve got any innovative ways of cooking quinoa I’d love to hear them. I just want to grab that fork and star eating! I tend to get cravings for healthy food when I’ve been eating too much rubbish and one pot cooking makes it a lot easier to go for the healthier option. This reminds me I haven’t cooked quinoa for ages, I tend to add it to casseroles etc rather than serving it as a grain.